A worldwide growth in street vending has sparked controversies regarding the right to public space, arbitrary enforcement, right to livelihood, and treatment related to immigrants and race. As a result, a sometimes acrimonious debate has taken place among various stakeholders — including vendors, local government, formal businesses and property owners, community organizations and pedestrians. Street vending is becoming an urgent issue in Los Angeles, where the City Council is currently considering whether to lift a ban that affects the way of living for some 50,000 people. But many cities around the world are facing the same considerations. 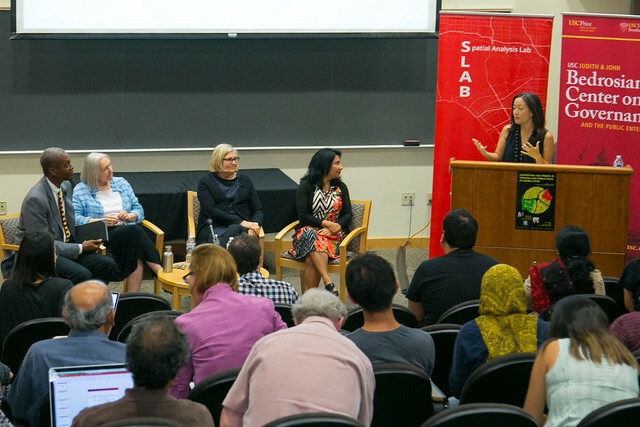 The first “Contesting the Streets” symposium occurred five years ago at UCLA in partnership with USC, an event which SLAB director Annette Kim attended and called hugely influential for her. Kim recently had her work on the sidewalks of Ho Chi Minh City in Vietnam exhibited on campus. More photos from the event are available on Flickr. Crawford said that addressing the differential treatment of people of color and immigrants in public spaces needs to be at the forefront of all public space discourse. New York tried to re-imagine the streets for pedestrians and cyclists with former Mayor Michael Bloomberg’s public space initiative, but at the same time ushered in a “Stop and Frisk” policy that allowed the NYPD to stop, question and search any suspicious pedestrian, leading to 700,000 people – the vast majority of which were African-American or Latino males – being stopped in 2011 alone. Day two of the conference featured paper presentations and panel discussions on a variety of topics. During the session on “Street Vending Struggles Over Time and Space” – moderated by Kim – Sally Roever, urban research director for Women in Informal Employment: Globalizing and Organizing (WIEGO), detailed data from a survey of street vendors in 10 cities around the world. Most striking was that all these cities had different sets of local bylaws and urban policy, yet the survey results were extremely similar. The report found that earnings generated by street trade are the main source of household income in most homes of the respondents, 62 percent had no alternative income source and only 20 percent had someone in the household with access to health insurance. Problems most often cited by the street vendors included the security of vending site, harassment by police, confiscations of goods and evictions. The informality of street vendors is in natural opposition to urban planning, but University of New Mexico Professor Renia Ehrenfeucht indicated that this doesn’t have to be the case. Discussant Gregg Kettles, former Deputy Counsel for Los Angeles Mayor Antonio Villaraigosa, questioned the lecturers on whether formalization was the right path for street vendors, noting that perhaps rules, regulations and taxes could damage the industry. At a global session, titled “The Politics of the Public Imagination around Street Vending” – moderated by Bostic – Darshini Mahadevia from CEPT University at Ahmedabad, India, and Lissette Aliaga-Linares from the University of Nebraska at Omaha discussed street vending laws in India; Lima, Peru; and Bogota, Columbia. Mahadevia noted that India has progressive legislation and high-court rulings regarding street vending, but they are not being followed. Evictions continue, and vendors have to pay protection money or get harassed. USC Price Professor Tridib Banerjee provided commentary about the global economy, global connection and ties between the formal and informal sectors. “I would argue the two sectors represent more of a continuum than dualism that has increasingly become more and more interconnected in the new global economy,” Banerjee said. In addition, other Price faculty who participated in panels included Assistant Professor Nicole Esparza and Professor Martin Krieger.